To be or not to be ruined? Sometimes we do a project and things just don’t go as to plan. With this card I had a few minor mistakes that I thought would look good, only to have at the end of it something happen and I went NOOOOO! After stamping the sentiment I was glueing the flowers in place and didn’t realise that me being me had ink on the outside of my pinky. (Those who know me well will realise I am a mess. I often spill something or get myself dirty all the time) So when I placed that flower down my hand rested on the card and bam, black little dot appears under the sentiment, just like that pimple as a teenager that made an appearance before a big event with lots of photos. So I could try to cover it up with some Bling, flowers or other element. The spot where it is I don’t know if another element would really work there. I could try and dump it. I could say damn this card is ruined and just start again. However I didn’t want to waste all my work. I could also just leave it. Which is what I decided to go with. I had a few reasons behind choosing this option. I didn’t like the first two options for fixing it. I try to find the positive in most things. These little imperfections don’t ruin the card they show someone that I took the time to hand make this card. It shows everyone that it isn’t store brought and that it is personal. So what would you have done? Cover it, Dump it or leave it? Shhhhh don’t tell anyone but I did cover one little mistake up, the large flower. When you use an embossing tool the paper needs to have enough give for it to be pliable. I find it needs to have many separate petals or if not you will need to either cut them or use a little water spritz to help make it pliable. This particular flower I forgot to spritz and when working with it caused a little tear in the base. I knew it was going to be stuck down on this particular place and I could also add a bit of bling to ensure it would’t be seen. (Phew crisis averted) Play around with the embossing tools and many different forms of flowers and you will see what works for you. If you are a CTMH buyer you have seen our catalogues, if you haven’t feel free to hit annual ideas tab and the seasonal expression tab on my home page to download to browse at your own leisure. There are some fantastic stamps there. For this card I have used the The best Things Stamp set. This stamp set is not featured in any of the CTMH catalogues but is found on my OBA. There are a few other stamp sets that do not appear in the catalogue so PLEASE take some time to browse all the stamps sets available here. I hope you like this card and have learned a bit from my mistakes.Feel free to share your experiences with a “ruined project”. Today I will talk about two ways of embossing. There are variations and further ways to improve on these techniques but I will be talking about the basics today of heat embossing with powder and dry embossing with folders. I love both equally and have a project using both techniques. I remember heat embossing when I was a child with my mother. We didn’t have the heat guns back then. What we used to do was turn the toaster on and hold the card stock above it. That idea still works today so if you can’t afford a heat gun just whip out the old toaster and give it a go. To begin have a piece of a4 paper with a fold in the middle handy. Stamp your image or sentiment with the Versamark Stamp Pad. Then using one of the embossing powders cover the stamped image with powder. Tip the excess onto the a4 paper and tap the back of the card to ensure all excess has left the area around the image. Then pour the powder back into the container. By having the fold in the paper to begin with that acts as the funnel and ensure it is easy to pour back into the container ensuring you are not wasting any. Then using your heat gun heat the powder so it melts. If you are using a toaster then do heat from underneath. Also remember when using any heat instrument keep the paper from an element as it can catch fire. Sorry just had to put that here as I don’t want to be responsible for not adding a warning. When dry embossing most crafters will have a big shot or a cuttlebug. I have the big shot and find that it is extremely sturdy for all my needs. Do not fret if you do not own one of these machines. You can still use embossing folders. All you need is a rolling pin and a hard surface. Place your card stock in the embossing folder and press heavily on the rolling pin to add pressure as you roll it over the entire card. That is all those expensive machines are doing anyway. Give it a go and see if you can get the same results. Have you got any other tips like this you want to share with me? Either comment below or email me at tanya.armitage@me.com and share your tips on what you use. 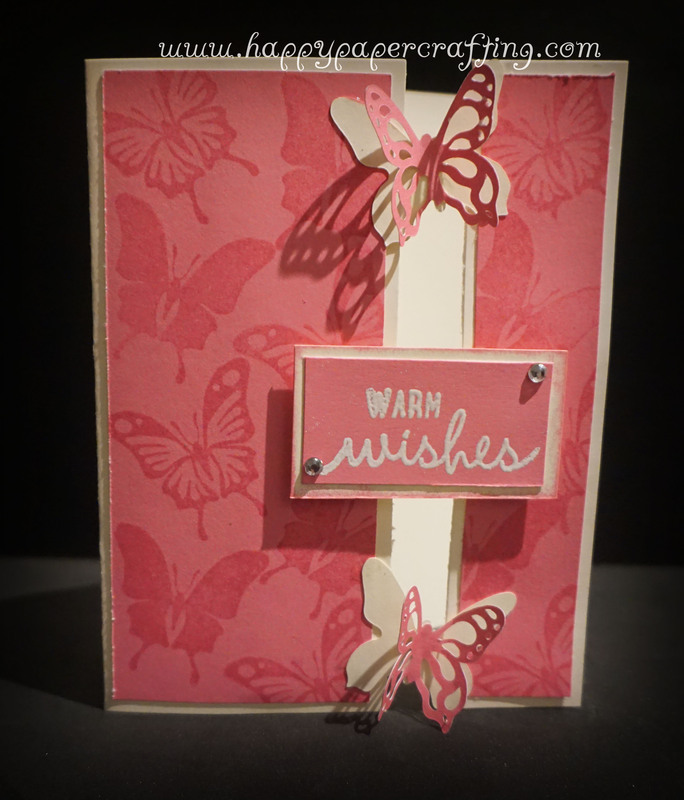 Below is a card that I have used both heat embossing and dry embossing on. I have left a blank space in my embossing to stamp and heat emboss the sentiment. If you would like the instructions to make it simply make a purchase from My OBA before January 31 2016and I will email them to you. 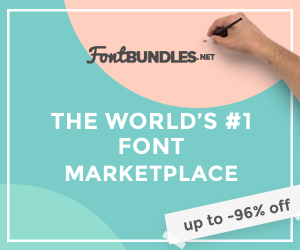 There is no minimum order requirement for this. I hope you give these ideas a go and share your thoughts below. Today I want to share with you a card I made at the request of a friend. 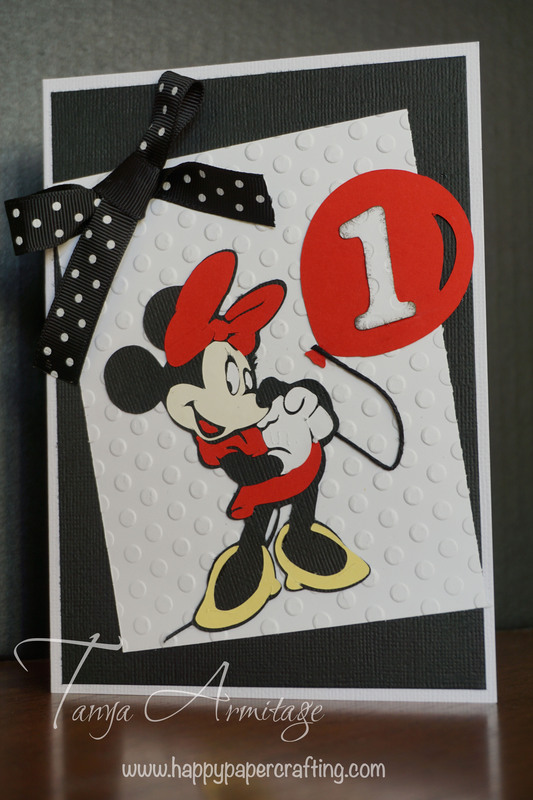 She wanted a Minnie Mouse card made for her cousin who is turning 1. I had fun making this card. It was quick and easy and a great way to use up some scraps for Minnie mouse. As you may be able to tell from my previous post. I love the Disney characters. So yes I own a few of the Cricut cartridges digitally. This Minnie mouse layered image come from the Disney- Mickey & friends Cricut cartridge. I set the size at relative 4″. If you are going to try this and are new to Cricut, using Relative dial size automatically sets each item for cutting to be set at the size to match the black base/shadow image. The card was made to measure 5×7. I cut a piece of black card stock measuring 4¾” x 6¾”. I then cut a piece of white card stock to 4″x 5¼”. This white piece I then embossed with the dot embossing folder. I followed the assembly instructions in the handbook for Minnie mouse. I Attached her to the embossed card stock. Adhered the black card to the 5×7 card and then attached the embossed white on an angle to the black card. I feel that by placing it on an angle adds a point of interest for the card. I then glued the balloon to the position I was happy with and then glued the string down. I used liquid glass to attach the string, I find when sticking fabric down it is best. I just get a little bit to the tip and then wipe along where I want so there is no leakage onto the project. I had some black and white spotted ribbon and made a bow and positioned it in the corner of the white embossed card. I tried to make sure none of the ribbon was outside the card space as I didn’t want to squash it too much when placing in the envelope. I hope this inspires you to create some cards this weekend. Please feel free to pin this to Pinterest for future reference and to share it with your friends. Hi everyone, Thank you for taking a look at my very first Blog post. I was thinking of what to share and decided to share this card. I came across the idea of gap cards in an old magazine and combined it with my love for butterflies. When I am not scrapbooking or making gifts and cards for special occasions, I am making cards for all occasions. 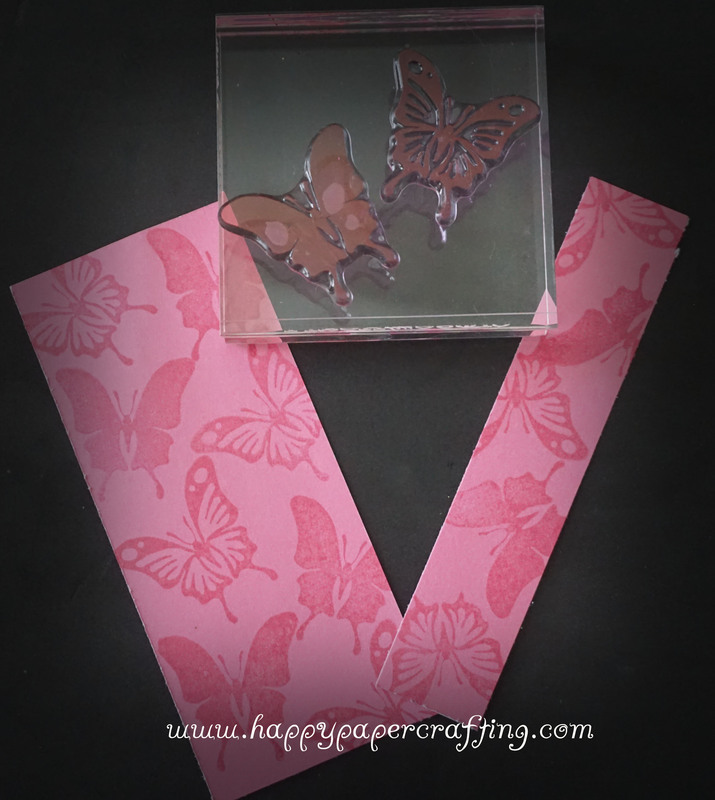 Besides being girly I love butterflies in my projects as they can be used for many different occasions. There have been many times where I have the intention of making a specific card for someone but sometimes time gets away from us and our plans do not eventuate. By having all occasion cards on hand I am able to use one when these instances occur. This card is quick and easy and you can use it either this exact card or basic design for many occasions. I began by trimming two strips from the front of a card. First 1 1/4″ x 5 1/2″ and the second at 1/2″ x 5 1/2″. The second strip will not be needed for this card so you can save it to use on another project. Cut Two pieces of cotton candy card stock (or any colour you choose), 1 measuring 3 1/2″ x 5 1/4″ and 1 measuring 1″ x 2″. From the first piece trim a piece off measuring 1″ x 5 1/4″. Trim a piece of colonial white card stock measuring 1 1/2″ x 2 1/2″. Sponge the colonial white piece with cotton candy ink. Stamp background using the stamp set Your Own Kind of Wonderful, I picked two butterflies and used the ‘Tone on Tone’ technique to create my own pattern (Tone on Tone is using the same ink colour as the card stock). Using the random stamping technique I stamped the butterflies alternating them. To give it a more interesting feel I stamped over the edges. I think it looks great. Remember this technique next time you can’t find the exact paper you are looking for. I then attached the these stamped pieces to the card. From the Artiste Cricut cartridge, Cut 2 solid butterflies (accent 4 shift ‘spring’ image) and 2 filigree butterflies (accent 4 shift ‘K’ image). To assemble the butterflies you slightly bend the wings, doing this will keep the wings away from the glue and give them a 3D look. Use liquid glass or another adhesive on the underbelly of the butterfly. Attach this to the solid butterfly. 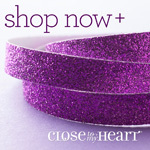 Stamp your sentiment onto the Small piece of cotton candy card stock. I embossed mine with white embossing power. Then attach to small colonial white card stock. Line the loose piece up with the card so it reforms the original card with the 1/2″ gap. put glue on the four corners of the butterflies and place them as to join the loose piece with the main card. Using 3D foam tape to attach the sentiment to also join the two pieces. You have now completed your card. Adjust the wings of the butterfly so they sit to your desired look. I hope you had fun assembling this card.